At St. Edward’s Church, Goathurst. 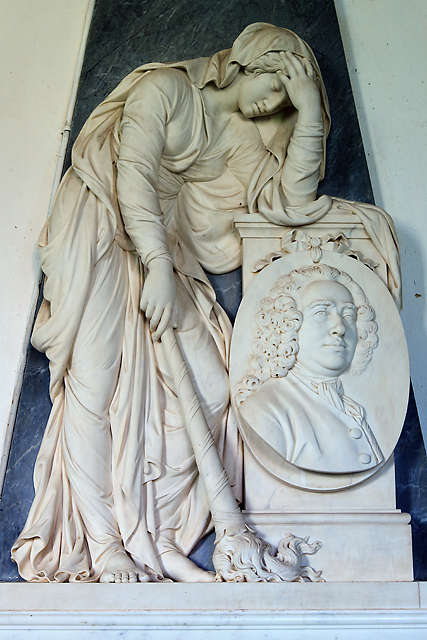 The monuments erected to the Halswell / Kemeys-Tynte family include names of some of the greatest sculptors to have worked in Britain, John Michael Rysbrack (1694 –1770) and Joseph Nollekens RA (1737 –1823). The seventeenth century monument which includes sculptures of all the members of the family at that time is also a triumph to an anonymous master sculptor of the time. 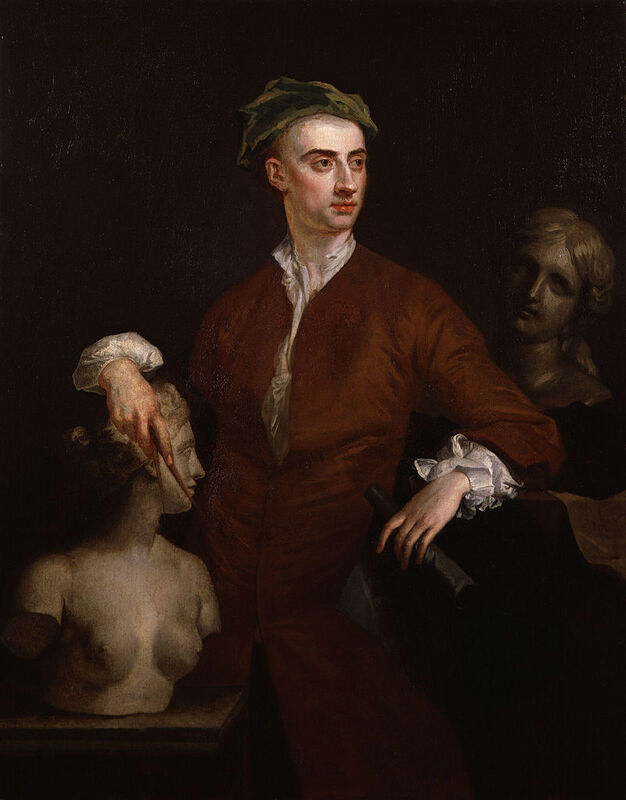 John Michael Rysbrack (1694 –1770) by John Vanderbank, c. 1728. 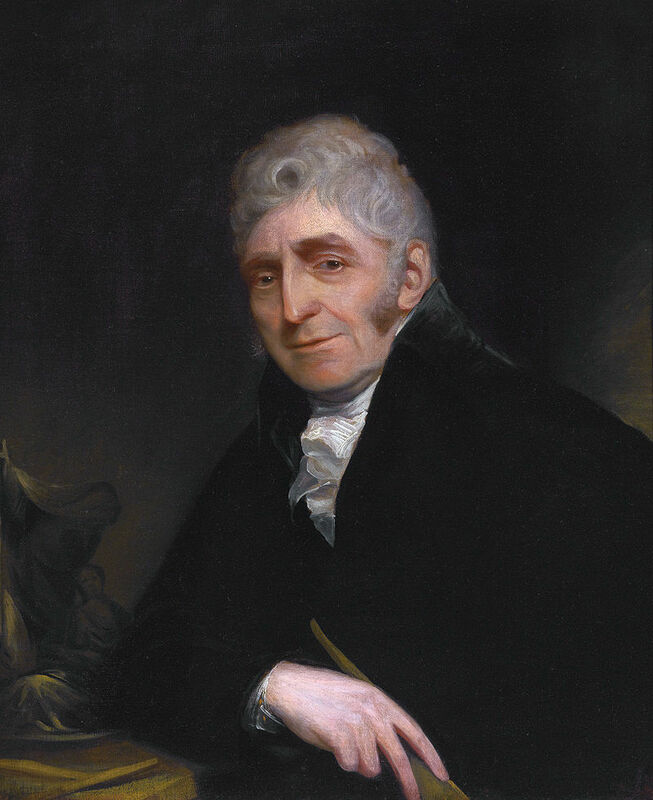 Joseph Nollekens RA (1737-1823) by Sir William Beechy. There is speculation as to where the Halswell family worshipped and were buried before the seventeenth century. The tenancy of Taunton Priory of some parts of the Manor of Halswell, from at least 1285 and possibly right up to the Reformation in the 1530’s, poses interesting possibilities, as does the discovery in 2015 of six thirteenth century gothic windows in the Gatehouse, or Stable, block at Halswell. However what we do know at present is that the first monument and seemingly the first burial of a member of the Halswell family in St Edward’s Church, which is within the boundaries of the Manor of Goathurst, rather than Halswell, was only after 1558. 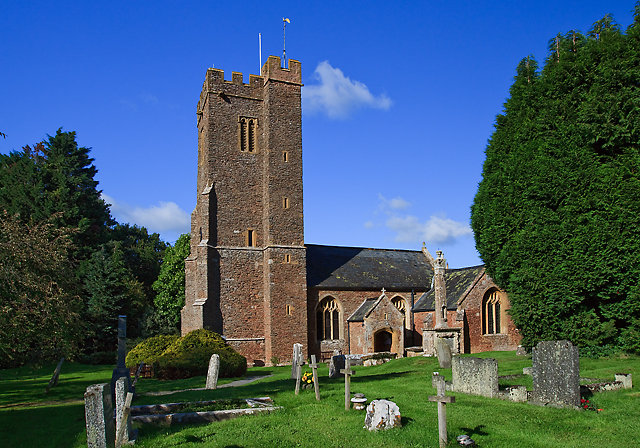 It was in 1558, to settle a dispute between the Paulet family of the manor of Goathurst and Niclolas Halswell about title and rights to the church, that Nicholas Halswell obtained a plot of land to the north of the Chancel, St Edward’s Church, Goathurst, upon which to build ‘an Ule or Chapell for himself and his heirs forever’. Nicholas Halswell died in 1564, his son Robert in 1570, and Robert’s son Sir Nicholas Halswell (c. 1560-1633) died in 1633. 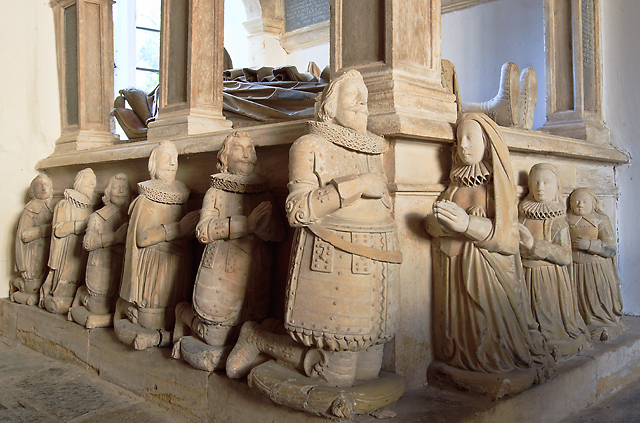 It is for Sir Nicholas and Lady Bridget that the magnificent early seventeenth-century Halswell monument was erected. St Edward’s church, Goathurst The C14 west tower is the earliest part of the church which has diagonal supporting buttresses. The rest of the church is entirely Perpendicular. Monument to Sir Nicholas Halswell. 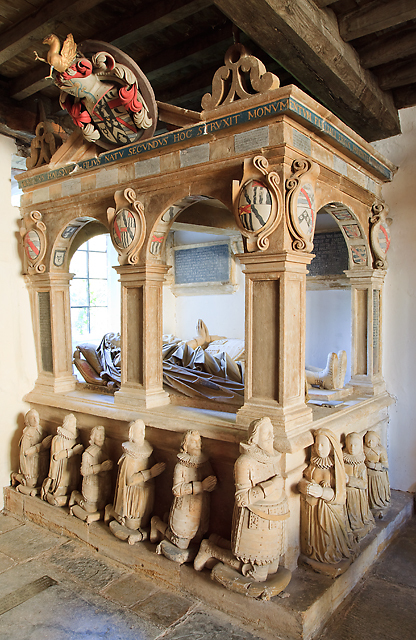 In a corner of the north chapel is the canopied tomb-chest of Sir Nicholas Halswell (†1633) whose recumbent effigy lies alongside that of his wife Bridget. Around the sides are grouped the children, six sons on the long side, three daughters on the short. The only son of Robert Halswell Esq. of Halswell House, he was a Justice of the Peace, and Deputy Lieutenant of the County of Somerset. 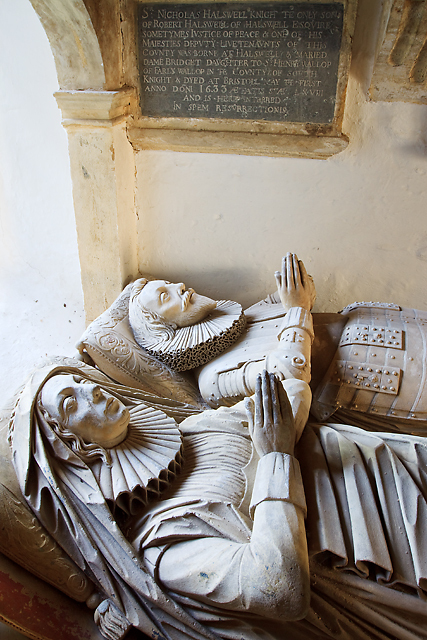 Sir Nicholas Halswell (†1633) and his wife Bridget. 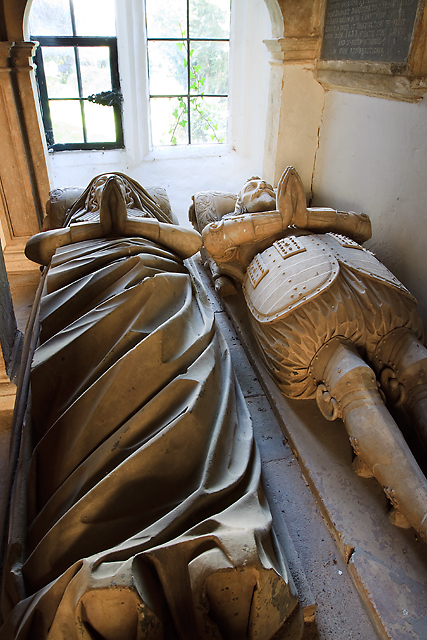 The well carved effigies of Sir Nicholas Halswell (†1633) and his wife Bridget. The sons and daughters of Sir Nicholas Halswell (†1663) and his wife Bridget. Halswell family monument – A large standing monument containing a faded lengthy Latin inscription to the Halswell family, and flanked by columns supporting an open segmental pediment. On each side are two standing allegorical figures. Dated c.1650. Monument to Sir John Tynte. 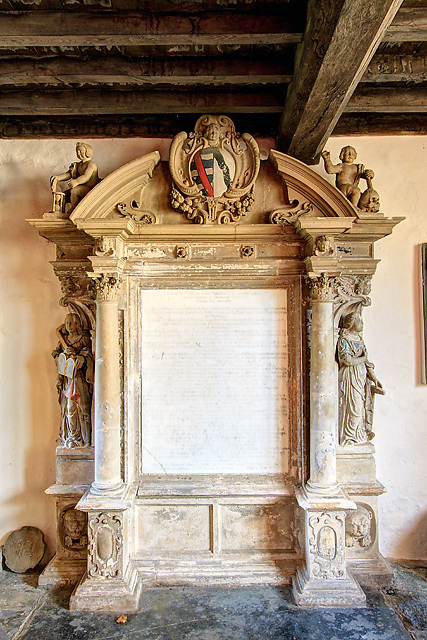 This large monument by J M Rysbrack has at the top the bust of Sir John Tynte (†1742), a former rector of the church. 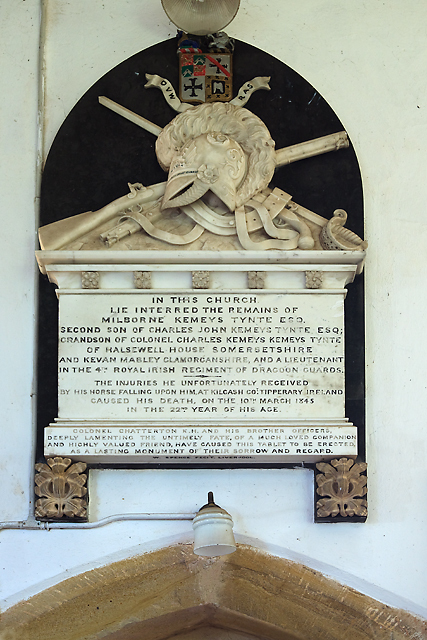 Monument to Sir Charles Kemeys-Tynte. 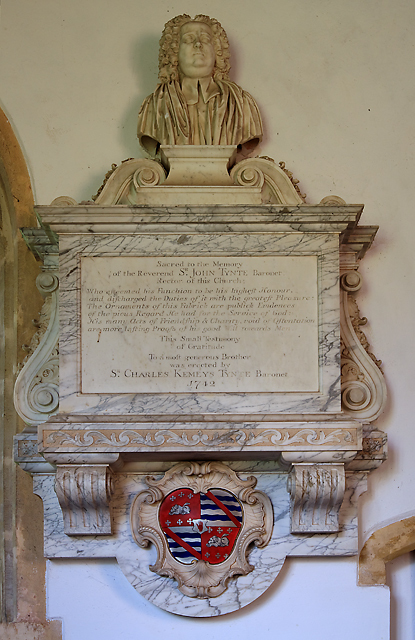 This standing wall monument to Sir Charles Kemeys Tynte (†1785) is by Nollekens. The grieving female figure is extinguishing a torch, and leans on a pedestal containing a portrait medallion of the deceased. Monument to Isabella Kemeys. 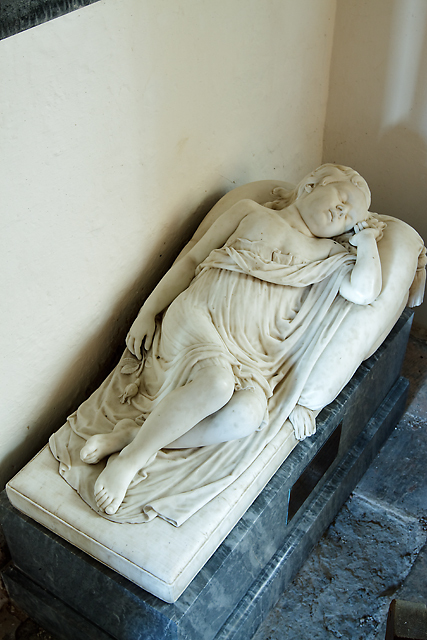 Represented as a sleeping child in marble is Isabella Anne Kemeys aged 3 years and 9 months, who died in 1835. By Raffaele Monti. 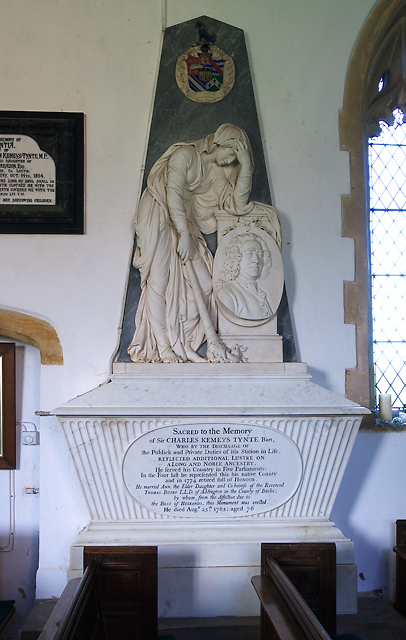 Monument to Milborne Kemeys-Tynte. This is a soldier’s memorial decorated at the top with a crossed sword and rifle, a pistol and a helmet. The unfortunate Milborne Kemeys-Tynte, late a lieutenant in the 4th Royal Irish Regiment of Dragoon Guards, died of his injuries caused by his horse falling upon him at Kilcash, Co. Tipperary, Ireland, on 10 March 1845, aged 21. The monument was erected by the colonel of the regiment and his brother officers.